Thanks to mzn for tagging me to come up with my ten favorite foods. Of course you understand that this kind of list comes swathed in disclaimers of all kinds. I knew immediately what answers 1 and 2 would have to be, but but everything else is more or less ex tempore, and probably seasonally influenced. 10. Kabocha soup of many colors. Really, you want to make this soup. 9. Apples, especially hard sour apples at the beginning of their season. In early fall macouns, then russets, now winesaps. 8. Chocolate bourbon pudding with plain whipped cream (Do you think I can legally post this recipe? It was in a magazine about twenty years ago). 7. Canelés—mildly sweet baked eggy things. I’ve only had these twice, once when I was six, and once five years ago. They were so good. 6. A decent cup of tea. 5. Pasta with tomato sauce. It's what the angels eat in heaven. 4. Leftover pasta with tomato sauce reheated in an iron pan with a little extra olive oil and garlic. 3. Maida Heatter’s Chocolate Gingerbread, and almost every other recipes in her Book of Great Chocolate Desserts. I just made some. I love the smell of the hot coffee mixing with the cool butter. 2. Whole artichokes with vinaigrette, and then I love to look at the pile of scraped leaves on the table afterward. An example of the necessity of ruins. 1. Black cherries in June (Oddly enough, I do not especially care for the sight of the stones and stems). I’ll illustrate this with an artichoke print, even though cherries are in first place. See items 1 and 2, above. I humbly request a top ten list from Dagmar. Thanks for meme-ing along. 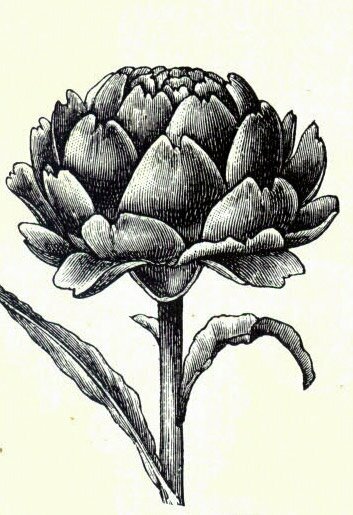 You reminded me how good artichokes are and so I got myself some. i love number four. i really do. i save leftover pasta for this purpose exactly. it's true. Thanks for thinking of me! I am already thinking of things that shoulkd not have been omitted. blogs lunga, vita brevis.